Niki Lauda won the Dutch Grand Prix a week after he had announced he would be retiring at the end of the season. It was to be his 25th and final grand prix win and, on a weekend of farewells, it was the last championship race at Zandvoort and the last Dutch GP. Nelson Piquet stalled the pole-winning Brabham as the lights went out and so Keke Rosberg led through the Tarzan Hairpin from Ayrton Senna and a quick-starting Teo Fabi who for once made a great getaway in his Toleman. Lauda, who started in tenth, was carving his way through the field. Prost soon moved past Fabi and sat on Senna's tail with Lauda closing in fourth. On lap 21 Rosberg's Honda engine went up in smoke which allowed Prost (now past Senna) into the lead while Lauda elected to pit for new tyres. His stop was a quick one and he resumed ahead of Senna whose Renault engine was losing power. The race hinged on Prost's pit stop. It lasted 18 seconds and by the time he re-emerged he was behind Lauda who controlled the remainder of the grand prix although he had to use all his experience to hold off a fierce challenge from his team-mate on the final lap as his tyres lost all their grip. The eventual margin between them was less than a quarter of a second. "I wanted to change [tyres] early to get maximum benefit from my second set," Lauda explained. "But I think I stopped five laps too early, and by the end my replacement tyres were going off and I was sliding all over the place." "We agreed beforehand that it would be no team orders," Prost said. "It is important for Niki to win any races he can because if he slowed down to let me through, to gain more points for the championship, it would be bad for the team and for me." Lauda agreed. "If Alain needs a little help towards the end of the year to win the championship then I will give it to him. However, I am sure he is good enough to win it on his own." Lotus finally put its increasingly troublesome reliability issues behind it as Ayrton Senna took third and Elio de Angelis fifth with Alboreto separating them. 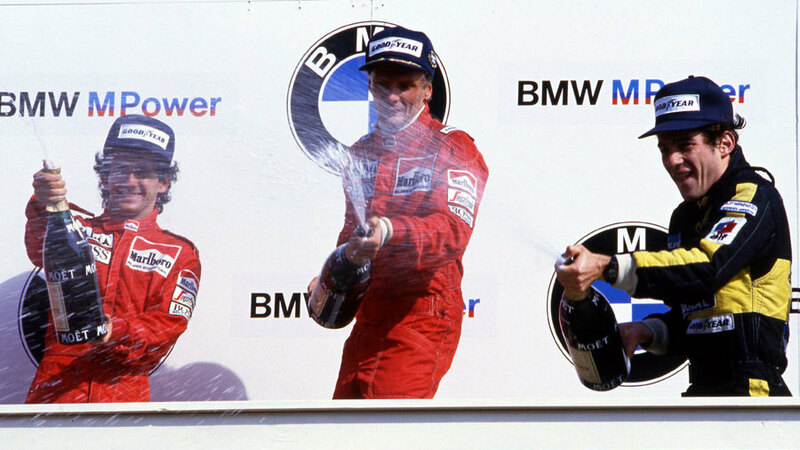 The result allowed Prost to take a three-point lead in the drivers' championship over Alboreto with de Angelis a distant third 26 points back. The contructors' race appeared to be a close call as well, with Ferrari three points clear of McLaren. It was the final outing that season of Andrea de Cesaris who was fired by team boss Guy Ligier. "I can no longer afford to keep employing this man," he told reporters after a series of accidents. By the time the F1 roadshow reassembled at Monza, Phillippe Streiff had replaced him. The race was also the last for Tyrrell's Stefan Bellof, who was tragically killed in a sportscar race in Belgium a week later.